Reprint. Film tie-in. Originally published: Oxford: David Fickling, 2006. Lines may divide us, but hope will unite us . . . Nine-year-old Bruno knows nothing of the Final Solution and the Holocaust. He is oblivious to the appalling cruelties being inflicted on the people of Europe by his country. All he knows is that he has been moved from a comfortable home in Berlin to a house in a desolate area where there is nothing to do and no one to play with. 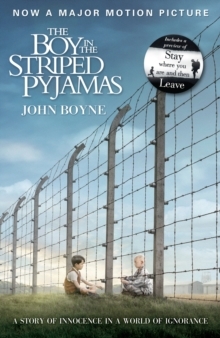 Until he meets Shmuel, a boy who lives a strange parallel existence on the other side of the adjoining wire fence and who, like the other people there, wears a uniform of striped pyjamas. Bruno's friendship with Shmuel will take him from innocence to revelation. And in exploring what he is unwittingly a part of, he will inevitably become subsumed by the terrible process.